Did you know that back pain is the second most common reason for people’s visit to the doctor, according to the American Chiropractic Association? Shocked? What makes this fact even more surprising is that this chronic pain condition tops the statistics despite more than a half of back pain sufferers don’t ask for professional help and try to cope with it on their own. So, obviously, you’re absolutely not alone with this problem. And, naturally, lots of ways to prevent, treat, and relieve back pain have been invented till our days. Let’s talk about the best shoes able to help with back pain when running, working out, and just walking daily. Orthofeet, ASICS, Brooks, and Saucony have proven to be the brands with some of the best sneakers for back pain, but world-known Adidas and Nike also get more and more skillful manufacturers in back pain shoe industry. If you’re reading this now, you surely haven’t any doubts that back pain sufferers need the right shoe, that can make a lot of difference with how they live their life. Thus, we decided to turn shopping into fun for you by making this list of 15 best shoe models that will definitely exacerbate your symptoms, prevent injuries, and let you do sports, walk a lot, and live a fuller and brighter life. 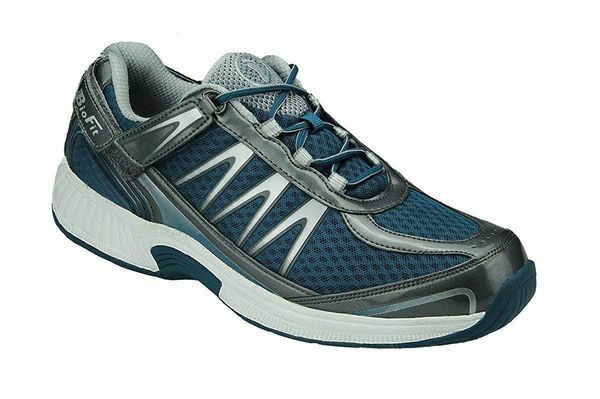 And here we present the first pair of walking shoes for back pain in our list – the Men’s Brooks Addiction Walker. Brooks is famous for their wide range of shoes made specifically for different foot issues, and the creation of these cool walkers for people suffering from back pain is not surprising. The best thing about this model is that unlike most walking shoes of other brands, these sneakers have the fit and feel of a running shoe, though being specifically designed for walking. Obviously, this gives +200% of comfort and support that your feet and back need. The external design of the shoe is rather classic and minimalistic: it’s available in black and white full grain leather material, and in the brown suede material. However, the manufacturer offers two variants of closure: traditional lace-up and slip-on styles. Brooks Addiction Walker is that very shoe able to give you a supported, smooth, secure, controlled, and easy walking experience. Extended Progressive Diagonal Rollbar (PDRB) significantly reduces the amount of stress and risk of injury to the back, knees, ankles, and hips. HydroFlow Technology is a system of chambers filled with a silicone oil which helps to disperse pressure as the foot hits the ground, absorb shock, and comfort the runner. Full-Length MoGo Midsole Compound improves the shock-absorption abilities of the sole. Cushsole for better response with every step. MC Pod Configuration gives exceptional motion control and keeps your feet in a correct and balanced position throughout the gate cycle. Good for overweight walkers, plantar fasciitis, and flat feet. Available in full-grain leather and suede designs. Offer a good motion control. Great cushioning and shock-absorption abilities due to HydroFlow, MoGo, and Cushsole technologies. Environmentally-friendly silica compound is used on the outsole. The toe box fits a bit narrow, so a half size up is required. Brooks Adrenaline GTS 18 is widely known as one of the most supportive stability running shoes, able to cope with long distances, short runs, and daily wear. Truth be told, the whole Adrenaline line is famous for keeping the wearer safe without sacrificing even a small percent of speed or comfort and stays in top positions for almost two decades already. Being often chosen by people with foot issues, the Brooks Adrenaline GTS 18 does an awesome job as shoes for lower back pain – the shoes that give you a chance to keep doing sports despite your back problems. These sneakers for back pain can boast an eye-catching external design with lots of bright colorways to choose both for men and women. The upper is made of super breathable Element Mesh material, which also fixes the foot in the right position without preventing free multidirectional movement. Also, the Brooks Adrenaline 18 is a huge step forward in terms of support and stability thanks to its innovative BioMoGo DNA foam, Segmented Crash Pad, and Diagonal Roll Bar in the midsole. A newly-designed heel cup keeps the heel locked in place. BioMoGo DNA is an innovative foam technology, which adjusts to the specific wearer’s foot and feels very lightweight and responsive. Progressive Diagonal Roll Bar (PDRB) is a flexible supportive midsole technology that provides smoother heel-to-toe transitions. Segmented Caterpillar Crash Pad is made up of fully-integrated shock absorbers to provide cushion and smooth heel-to-toe transition, maximizing the efficiency of every stride. Element Mesh upper material is a highly-breathable fabric, which also supports the foot and fixes it in the right, secure position. Roomy toe box for a comfy natural toe splay. Helps with back pain a lot. Great for marathons, short distances, and everyday wear. Very high breathability and proper moisture management. Good stability mechanisms prevent discomfort and possible injuries. Meet another classic walking shoes for lower back pain from the brand that is often associated with various feet issues. Indeed, Vionic work a lot to help people with at feet, pronation, plantar fasciitis, heel spurs, bunions, bad knees, and back pain walk comfortably and pain-free. Women’s Vionic Walker is a good motion control shoe able to help with back pain. It’s an example of a premium quality shoe, which is approved and recommended by podiatrists. Comfy and secure, the sneaker features supportive upper and anti-bacterial orthotics, shock-absorbing midsole and durable flex outsole. Active Motion System (AMS) technology is the podiatrist-designed orthotic with a flexible, cushioned outsole and a lightweight, breathable upper. PU Foam Base gives a soft cushy feel. Premium full-grain water-resistant leather upper. Firm, thermoplastic heel counter for increased stability and support for all-day wear. Good choice for plantar fasciitis. Provides both side and arch support. Breathability & moisture management of the lining. Despite ASICS Gel Kayano family is more known as leading sneakers for long-distance running, its latest representative – ASICS Gel Kayano 24 is also considered as one of the best shoes that are good for your back and knees. Indeed, all the comfort and support these sneakers offer can be felt as soon as you put them on. No wonder, as these stylish and high-quality shoes for bad back are stuffed with numerous up-to-date shoe technologies. Stability, support, incredible cushioning on several levels, exceptional comfort with the ability to accommodate to the wearer’s foot – and all that is represented in a lightweight midsole, which is durable enough to withstand any challenges you offer. The upper of ASICS Gel Kayano 24 is made of breathable light mesh fabric that allows for a decent moisture management and is odor-free. Besides, the upper construction wraps your foot securely, stretching in multiple directions and preventing irritation. With ASICS Gel Kayano 24, you’ll feel a huge difference in terms of back pain relief since that very moment you put them on. Yes, they are rather pricey, however, the effect is definitely worth that money. MetaClutch external heel counter provides improved support and creates exceptional locked heel fitting environment. I.G.S (Impact Guidance System) enhances the foot’s natural gait from heel strike to toe-off. Guidance Trusstic System provides midfoot structural integrity and improves gait efficiency. Guidance Line Technology is a vertical flex groove that decouples the tooling along the line of progression and enhances the gait efficiency too. GEL Cushioning System in the rearfoot and forefoot for a responsive ride with every step. FlyteFoam Technology is a high-density foam, which doesn’t pack out like most softer foams do – it gives exceptional bounce back and responsiveness to the shoe. FluidRide Technology also invests into cushioning properties of the shoe and invests in the light weight of the shoe. Ortholite X-40 Sockliner adds extra cushioning and controls the moisture inside the shoe. Dynamic DuoMax System is a new updated version of a traditional DuoMax technology with improved stability, support, and reduced weight. AHAR rubber outsole provides good grip and traction on the variety of surfaces. ASICS FluidFit Upper is a combination of a multi-directional stretch mesh and stretch reinforcements for a truly customized glove-like fit. Good for long distance running. Glove-like fit that adjusts to the foot. Impact Guidance System helps control your gait. Available in lots of colorways. Help with the bad back, knees problems, ACL injury, Plantar Fasciitis, overpronation, IT Band, flat feet. These Brooks’ running shoes for back pain are probably one of the most versatile models on the market today: they work great for light workouts, long and short runs, and everyday use. The Brooks Ghost 10 is a high quality in an attractive package. Also, it’s a perfect athletic footwear for people with wide feet (as they have a wide toe box), plantar fasciitis, and shin splints. Engineered upper is stretchable so that it accommodates to the natural shape of the foot without squeezing it. Also, its breathable material allows keeping feet cool, dry, and odor-free. The BioNoGo midsole with Segmented Crash Pads and Omega Flex Grooves on the outsole provide a runner with premium level cushioning, proper stability, support, and good grip. The Brooks Ghost 10 is made to provide runners with a comfortable fit, it gives more comfort and room to big bunions, and will definitely help you with back pain. Segmented Crash Pad is designed to adapt to each step for the smoothest ride possible. 3D FIT PRINT upper overlays use a revolutionary screen-print technology for additional support without sacrificing the light weight and flexibility of the shoe. Narrow, medium, and wide widths are available. Helps runners with numerous foot, knees, and back issues. Entry-level premium cushioning thanks to strategically placed two layers of foam. Lightweight support to the lateral and medial sections. Durability issues in the upper are possible. If you’re a lady looking for a pair of orthopedic shoes for back pain that has great aesthetics too and doesn’t look like it belongs to your grandma, these fantastic Orthofeet’s shoes for back pain sufferers are a solution. The upper of the Orthofeet Coral is soft and non-binding, with a wide toe box and extra depth that allows to accommodate for feet with foot injuries and give a better support to the painful back. Stretchable knitted fabric doesn’t bind a foot and lets it breathe. Lightweight soles and insoles work together to provide a sufficient amount of cushioning, support, and excellent stability, making every step you take soothing with comfort. From bunions to lower back pain, the Coral will cope with any challenge to relieve your steps. Ortho-Comfort premium orthotic insoles feature anatomical arch support and multiple cushioning layers. They enhancing comfort and ease the stress and pain on the heel, ball of the foot, knees, hips, and back caused by flat feet, over-pronation, plantar fasciitis, bunions, arthritis, and diabetes. Ergonomic-Stride design softens steps, enhances stability, adds spring, and facilitates foot motion. Gel Heel Pad Insoles conform to the shape of your foot giving extra cushioning and support. Podiatrists-approved for people with back pain, bad knees, flat feet, overpronation, plantar fasciitis, bunions, arthritis, and diabetes. Extra depth design to provide ample space for custom made orthotics. Stretchable upper design for a relaxed fit at the forefoot relieves pressure on Bunions, Hammer-Toes, and sensitive feet. Lightweight cushioning sole with the Ergonomic-Stride design. Soft seamless lining eliminates pressure points and friction against skin. Anti-microbial fabric on the inside. Not true-to-size (run one size small). Here’s an updated pair of Brooks running shoes that can help with back pain too – the Brooks Glycerin 15. They combine incredible arch support, fast ride, and top-line cushioning that neutralizes any impact forces. Though the company has already produced their next (16th) edition of the model, we still recommend the 15th edition as it has only several insignificant differences, but costs much more. Thanks to upper’s 3D print overlays, this shoe is more lightweight than its predecessors but still very supportive. And the Super DNA material in the midsole offers a personalized cushioning based on gender and weight. Smooth transition zone makes every step in these athletic shoes for back pain secure and comfortable, and the segmented outsole gives you the freedom of multidirectional movement on various surfaces. 3D FIT PRINT is a set of upper overlays made in a revolutionary screen-print technology, which give additional support to your feet without sacrificing the light weight and flexibility of the shoe. Super DNA midsole cushioning technology is famous for providing 25% more adaptable cushioning than other standard DNA midsoles. Brooks Omega Flex Grooves make the sole unit more flexible for comfortable movement. Segmented Crash Pad and Plush Transition Zone provide a smooth heel-to-toe transition. Ideal pressure zones – the pressure is evenly distributed throughout the feet so the pressure on lower back minimizes too. Improved flexibility compared to previous models. Super DNA midsole provides premium cushioning. The silhouette is a bit bulky. Saucony is the running shoe brand that gets more and more popular at present time. So, not surprising that one of the most supportive shoes for back pain – the Redeemer – is manufactured by Saucony. The upper of Saucony Redeemer is meant to let your feet breathe and completely secure thanks to the ISOFIT technology that adjusts to the natural foot shape. These cool sneakers for back pain are absolute support monsters: the widest sole of all Saucony models is fitted with hard TPU pillars over the medial post, the PWRGRID midsole keeps the foot in a balanced position and attenuates shock, and there’s an extra external support frame in the heel area too. IBR+ outsole technology gives good grip and traction over the roads. EVERUN Topsole allows for continuous highly-responsive cushioning with every step. ISOFIT technology adjusts the shoe to the specific wearer’s foot with a comfortable and sock-like feel. PWRGRID+ midsole technology adds extra cushioning and bounce to the shoe. TPU Pillar gives incredible support to the medial mid-foot area. Full widths range is available. Semi-curved shape of the sole accommodates the natural shape of the foot. Flexible upper and sole construction. Corrects the rate of pronation. Engineered mesh upper allows for dynamic lightweight fit. Great support in the midfoot area. Hoka One One Clifton 4 athletic shoes for back pain are an example of how unknown brand earns the fame. Evolving from edition to edition, the 4th Clifton can compete with eminent brands in quality, comfort, and popularity too. The updated upper is more durable, it has elastic and breathable properties, adapting to the shape of the foot and allows the airflow within the shoe. A full-length EVA foam in the midsole also invests in the durability of the sneaker, making it very responsive. And the molded Ortholite Sockliner reinforces that cushy effect and adds enhances the in-shoe comfort. The outsole is equipped with strategically redesigned lightweight rubber, which improves traction and heel-to-toe transition the shoe offers. The Hoka One One Clifton 4 is definitely worth a try as it can be your winning formula to win those lower back issues. Engineered Mesh material is more durable and offers more support on key areas of the foot than the previously used Air Mesh, but it still is as breathable. Full-length EVA foam package replaced the Hoka’s proprietary HIP CMEVA to make the sneaker more responsive and durable. Ortholite Sockliner invests in the in-shoe cushioning and provides anti-bacterial effect inside the shoe. Cool design with lots of color options. Numerous updates are made comparing to the previous version of the shoe. Ideal for long-distance running and training. May feel a bit stiff. Cushioning is not very long-lasting. Here’s another pair of Orthofeet’s men’s orthopedic shoes for back pain. These sneakers help enhance comfort and alleviate pain in the back, knees, heel, hips, and feet. The upper mesh material allows for proper moisture-management and odor-free wear. The traditional lace-up closure is replaced with convenient Velcro straps, and the toe box area is protected with durable stability overlays. On the inside, you’ll find premium orthotic insoles that offer anatomical arch support, and in the heel area, there’s a cushioning pad that conforms to the contours of the foot as you walk. Ortho-Comfort premium orthotic insoles with anatomical arch support and multiple cushioning layers improve foot and leg alignment, enhancing comfort and easing stress and pain on the heel, ball of the foot, knees, hips, and back caused by flat feet, over-pronation, plantar fasciitis, bunions, arthritis, and diabetes. Ergonomic-Stride sole design softens step, and helps propel the foot forward. Ortho-Cushion System of lightweight sole with air cushioning adds spring to your step. Good as casual, athletic, and work shoes. Orthotic support thanks to premium orthotic insoles, featuring anatomical arch support and multiple cushioning layers. Heel-Strap enables adjusting the shoe in the heel area. This sweet pair of Brooks Ariel 16 is a favorite of women looking for shoes that are good for their back along with providing motion control, responsive cushioning, stable and secure stride. These walking shoes for back pain from Brooks will also be a great solution for people with flat feet and overpronation. Despite the model was initially aimed for running, the technologies used in it allow to wear these beauties as a walking sneaker. Looking for fantastic support in a bright, eye-catching design? Look no further than the Ariel 16 from Brooks. Progressive Diagonal Roll Bar provides improved control over the foot for a smooth ride. Removable Ultimate Sockliner gives extra cushioning from the inside. Good breathability & moisture management. Not true to size (runs a half size small). If overpaying for quality and comfort is not an issue for you, you will never go wrong with the Adidas Ultra Boost as a great running shoe for back pain. Lightweight, secure, properly cushioned, and stable – these shoes are a way out for back pain sufferers. The upper of the sneaker is made of highly breathable and stretchable Primeknit material, and at the rearfoot, there’s a heel cage for improved rearfoot security. Breathable mesh lining and a moisture-wicking insole reinforce moisture-managing abilities of the upper. The whole midsole is made of a unique Ultra Boost compound, which is comprised of 3,000 energy capsules to charge up every step with it. The Adidas Ultra Boost is an ideal companion for women, who wants a fashionable running shoe able to relieve back pain, and prevent any injuries.! Ultra Boost is definitely one of the best cushioning technologies ever. This foam has energy-returning properties, which keep every step charged with an endless supply of light, fast energy. Besides, it’s super lightweight. Continental Rubber outsole provides extraordinary grip in wet and dry conditions, staying flexible at the same time. Torsion system is a thermoplastic arch support designed to allow the forefoot and rearfoot to move independently and adapt to running surfaces without straining the foot through excess motion. Primeknit upper material for a stable fit and breathable feel. Incredible external design with a great variety of colorways. Sock-like arch support provides a comfortable foot-hugging fit. Nike Air Zoom Vomero 13 is premium back support shoes, that are good for long distances and keep a comfy responsive feel step by step. The upper of the shoe features a set of updated Flywire cables that are wider than traditional Flywire, so they allow for more flexibility and a smoother, less distracting feel as you flex the forefoot. Also, the upper engineered mesh is very breathable with awesome moisture-wicking abilities. Overall, external design is really stylish and eye-catching, with a diversity of color options. The midsole of the Nike Air Zoom Vomero 13 is meant to be soft, responsive, give springy cushioning for the runner’s foot, and good protection for the runner’s back. And its semi-curved shape mimics the natural curvature of the foot, adjusting to every wearer. The outsole is made of BRS 1000 carbon rubber that ensures perfect traction on different surfaces, and the forefoot section features the Dura-DS traction-ready compound, which also attenuates the impact shock. Wanna shoes that are good for your back, manufactured by a famous brand and ready to pay for it? Nike’s 13th Air Zoom Vomero is exactly what you need! Flywire cables secure the foot by hugging and holding in the midfoot as you tighten the laces, giving exceptional support to the foot. Lunarlon cushioning is a soft foam compound, which is soft yet responsive and supportive. Zoom Air units in the forefoot and heel sections add some more cushioning and shock absorption, eventually heightening the overall experience of the wearer. Engineered Mesh is a cloth-like material that is soft enough to provide a breathable yet light wrap. Comfort Fit Collar offers a padded interior construction that supports the heel and ankles. Cushlon is a durable foam component that acts like a reinforcement that prevents fast breakdown. It benefits cushioning too. BRS 1000 carbon rubber on the outsole gives responsible traction over the surfaces. Dura-DS is a traction-ready and responsive compound in the forefoot of the outsole. Deep Anatomical Flex Grooves allow the foot to bend and move naturally without feeling stiff or unresponsive. Stylish and trendy external design in lots of colorways. Full widths range: Narrow, Regular, Wide, Extra Wide. Semi-curved shape mimics the natural curvature of the human foot. A ¾ length internal bootie prevents hot spots and blisters without wearing socks. Good option for neutral pronators. Springy and responsive underfoot cushioning. Forefoot section may fit a bit narrow. It’s no accident the Saucony Guide ISO, loved by runners all over the globe, is the first in our list of the best sneakers for back pain. What makes this moderate pronation road running shoe so unique? Firstly, this model falls under the ‘supportive shoes for back pain’ category that makes it maximally adjusted for people with this problem. Secondly, Saucony Guide ISO features great flexibility thanks to its Tri-Flex sole, which is also essential for back pain sufferers. Talking about the external design of this sneaker, it’s available in the limited amount of colorways, however, the silhouette is still streamlined and trendy. The ISOFIT upper technology, represented in Saucony Guide ISO, allows for sock-like soft feel, adapting to the foot’s shape and its movement. The midsole of the sneaker is made of two layers of cushioning to provide runners with a more responsive and smoother ride. But, also, the midsole construction helps to control the inward rolling of the runner’s foot to correct overpronation. As for the outsole, the Saucony took care of increased adaptability and flexibility of the forefoot area to make the shoe as comfy as it is. Tri-Flex sole design makes the shoe flexible in the forefoot and helps disperse force over a bigger surface area. PWRFOAM midsole technology distributes the pressure for a smooth and responsive ride. EVERUN Topsole construction works as an additional layer of cushioning that improves the responsiveness and energy return. The IBR+ is a flexible and lightweight material that also improves cushioning. Strobel Last for a softer underfoot feel. ISOFIT upper technology helps the shoe to adapt and adjust to the particular runner’s foot, it’s shape and motion pattern. The XT-900 carbon rubber material increases grip on various surfaces and makes the sneaker more durable. ComfortLite Sockliner gives extra cushioning from the inside of the shoe and provides moisture management, wicking all the sweat and diminishing the odor. Even distribution of pressure due to 8 mm offset. Effortless transition with every step. Adapts to the runner’s foot shape, size, and movements. Fit a bit narrower than the previous Guide models. Can cause some rubbing right out of the box. Women’s New Balance 1340v2 is an awesome pair of back support shoes on our list, which besides being good shoes for back pain sufferers also are a great option for overpronators. But what makes them obviously stand out is the level of motion control they can provide. The upper design of the second edition of New Balance’s 1340 is updated a bit and now it uses the synthetic mesh to minimize all possible irritations during activities, support a foot, and provide the runner with maximally breathable wearing experience. Cushioning is the first thing, which should be mentioned when talking about the midsole. The mixture of Acteva Lite, N2, and Abzorb foams makes the shoe’s cushioning very capable of reducing the impact your feet, ankles, knees, and, in turn, lower back suffer from. Another cool midsole feature is the T-Beam, which consists of a lightweight and flexible midfoot TPU shank – the element, which provides torsional stability and additional arch support. ADZORB forefoot cushioning technology makes the heel-to-toe transition smoother. TRUFUSE is an updated durable midsole material that invests in cushioning abilities of the sneaker. Ndurance tech in the outsole provides the right amount of grip on different surfaces. Blown Rubber in the forefoot of the outsole increase responsiveness in this area. N2 cushioning offers additional ground responsiveness and durability. ACTEVA Lite is the durable material, which is also highly-responsive. Stabilicore is the lightweight and flexible TPU shank manages arch stability and makes the heel-to-toe transition smoother. Highly responsive cushioning guaranteed by several technologies. High level of ankle support. Properly padded tongue and collar for increased comfort. Great arch support and torsional stability. Flexible and stretchable upper construction. Not true to size (run a half size smaller). Feel a bit narrow, especially in the toe box area. Can shoes help back pain? Definitely, yes! Especially, in the 21st century, when shoe technologies have greatly progressed. Nowadays, many people suffering from back pain, are looking for the answer to such a vital question: if it’s a myth or a truth that the right shoes can help back pain. In fact, you even can’t imagine that footwear has a really great effect on our health. Our back and soft tissues are considered to be the first organs to be influenced by shoes. Perfectly selected pair of sneakers can help reduce your back pain just as wrong footwear can cause it. Look at this: if you have some mechanical problems in the feet due to bad shoes, you’ll inevitably feel back pain sooner or later. Accordingly to this, if you change your footwear for the one, able to help you to correct your mechanical problems, it will lead to the pain reduce. However, don’t hurry up to throw away your favorite pair of shoes if it doesn’t “fit your back”. In the 21st century, you have an opportunity to upgrade it! Shoe inserts have been created to help people. Although they’re really effective and useful, don’t forget to consult with your doctor before using these “magical things”. Can arch supports cause back pain? Before answering a question as for the influence of arch supports on the back, it’s important to mention that arch support has a really great influence on developing a gait (a good or bad one). Your body follows your feet. Thus, the way they move contributes to the way the rest of your body does. So, now it should become clear for everybody that back pain is the result of what shoes you have on your feet. and only then the turn of a toe comes. When the process of walking goes wrong, this leads to the inappropriate shock absorption. In its turn, it makes your muscles and bones overstress. Therefore, the answer to the question above is “definitely yes”! Can old shoes cause back pain? Shoes which are old and worn out lose their ability to properly support your feet, knees, and back so that yes, old shoes do cause back pain. A lot of people have at least one pair of so old, but still favorite shoes. What about you? It may sound strange, but it’s difficult to answer this question without looking at these shoes. Old as well as new footwear can be the reason for your problems with the back. If your old shoes don’t have any deformations, able to lead to back pain, for example, damaged sole, inappropriate arch support and so on, you shouldn’t be worried about them at all! Everything depends on the origin of your purchase. If you take all necessary nuances into account when buying footwear, then you’ll not have any problems with shoes as soon as they become old. And vice versa, if your shoes don’t meet the requirements of healthy footwear, you’ll surely have difficulties, wearing even a new pair of shoes. Nevertheless, don’t forget to examine all your shoes. Why should you do this? When shoes are worn, the sole, as well as other parts, may be damaged. These damages will lead to the changes in your gait. In this case, back pain, as well as knee pain, will be forthcoming. However, you should also pay attention to the extra properties of the sneakers above, the brand, their aesthetics, and their main mission. Also, bear your specific foot’s needs in mind. Well, out of all the models listed in our top-15, which one would you buy first?